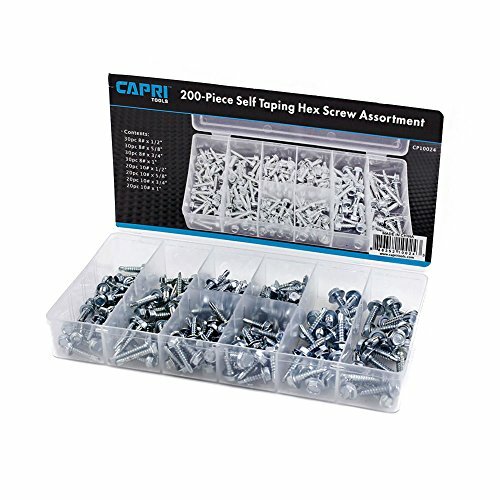 This Capri Tools 200-Piece self tapping hex screw assortment is ideal for thicker gauge metal to metal in applications such as air conditioning, ventilation, and heating. Each piece is constructed with zinc plated steel for corrosion resistance. Set includes 8 most-used sizes: 30 pieces #8 x 1/2-Inch, 30 pieces #8 x 5/8-Inch, 30 pieces #8 x 3/4-Inch, 30 pieces #8 x 1-Inch, 20 pieces #10 x 1/2-Inch, 20 pieces #10 x 5/8-Inch, 20 pieces #10 x 3/4-Inch, 20 pieces #10 x 1-Inch. Set organized by size/type in a transparent organizer case with snap-close cover for easy storage. If you have any questions about this product by Capri Tools, contact us by completing and submitting the form below. If you are looking for a specif part number, please include it with your message.